An angry AC Milan fan has put Brazil goalkeeper Dida up for sale on the internet ahead of next week's Champions League semi-final return with Manchester United. The 33-year-old, who joined Milan in 2000, was a hero after the shootout win over Juventus in the 2003 Champions League final, but his popularity has slumped after a series of errors. He was criticised following last week's 3-2 first-leg defeat to United at Old Trafford, when he flapped a Cristiano Ronaldo header into his own net and then left his near post exposed for Wayne Rooney to blast home a stoppage-time winner. It's unlikely the internet exposure will do much for his ego either. Dida failed to attract great interest on eBay. The price, before the Brazilian international was removed from the auction site on Friday, had reached just 71 euros (about $116.50) after 25 bids. DVD pirated in China, determined to cash in on the hype of Spider-Man 3, have taken piracy one step further... releasing faked copies of different movies in Spider-Man sleeves. Street vendors were selling discs marked with Spider-Man 3 packaging, featuring a picture of the hero crouching in a black spider suit, and crediting stars Tobey Maguire and Kirsten Dunst in Chinese. A copy bought for 10 yuan – (AUD$1.56) – came with the vendor's caveat that it was "not good quality". When played in a DVD machine, the screen showed a 2001 television movie Earth vs. The Spider starring Dan Aykroyd as a detective investigating the case of a spider-like killer. PUNY HUMANS! The GREAT NAVI discovered the SECRET of ENERGY! 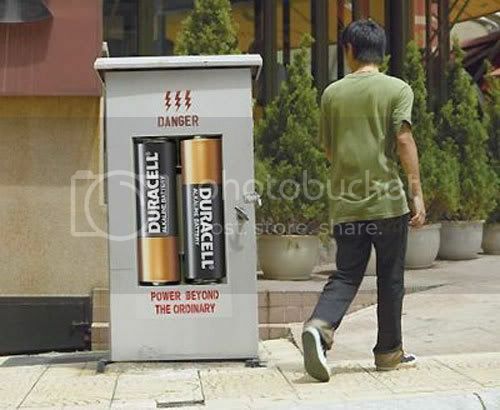 DURACELL! YES... it is CARBON NEUTRAL! The next time you're cut off by a crazed driver on your way to work, cut him a little slack. He could be racing for his life. "Drive" is an action-fueled drama following a diverse group of Americans driving for their lives (or the lives of their loved ones) in a sinister, cross-country road race. Some of them have been coerced into joining The Race; others have sought out The Race themselves, hearing rumors of the $32-million prize. Each has a reason to compete. And each must win for their own personal reasons. The twist is... the group does not know exactly whom they're racing against, or even where the finish line is. With each mile clocked, the drivers get closer - not only to the end of the road and a critical, life-changing victory, but to understanding the mystery behind The Race itself. Last day of work next Friday! It's interesting how time flies when you're havin' fun. I reckon my current role as an Energy Risk Analyst is the best yet. Learn heaps and had loads of fun doing what I do. I guess all good things come to an end. Hahaha.. I found this online. These payment artist are really creative. LAZY HUMANS! The GREAT NAVI found this on youtube and DUE to GREAT NAVI's KINDNESS, here's THE WORKOUT video that WILL appeal to your PUNY HUMAN mind. ughh.. back at work...! Slow day today... still trying to get into working mode.. hahaha.. Currently back home in KL! :D Had a really good time in HK... the sights, the hustle bustle of the city and of course the food! 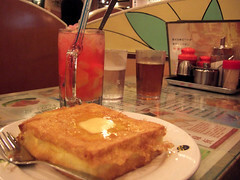 I can't get enough of Cafe de Coral's FRENCH TOAST! Yummy! ::drool:: bwahahaha... I'll have more update once I am back in Aus. PUNY HUMANS! I Have more Chad Vader for YOUR FEEBLE Cranium! HILARIOUS! Bwahahaha.. will be leaving for Hong Kong / Kuala Lumpur in a few hours. The single dumbest contestant on Who Wants To Be A Millionaire? Got this in an email quite some time back and I reckon it is quite funny... if it's true. Idaho resident Kathy Evans brought humiliation to her friends and family Tuesday when she set a new standard for stupidity with her appearance on the popular TV show, "Who Wants To Be A Millionaire." "Wow, seems like everybody is against what I'm thinking," said the too-stupid-to-live Evans. "But you know, sometimes you just got to go with your gut. So, let's see. For which is larger, an elephant or the moon, I'm going to have to go with B, an elephant. Final answer." Whoah! Google has done it again! If you're sick of paying for broadband that you have to, well, pay for? Introducing Google TiSP (BETA), Google's new FREE in-home wireless broadband service. Sign up today and those nice ppl at google'll send you your TiSP self-installation kit, which includes setup guide, fiber-optic cable, spindle, wireless router and installation CD. Interested? You can learn more about TiSP via this link, or get started now. On eBay: Goalkeeper Dida Did u place a bid??!! Come on, even I can answer that question correctly LOL. I don't want to be rude, but phrases like "bodoh kayu" spring to mind. LOL. Google's FREE Internet! !